These days, if you travel frequently by plane, you know that delays happen. They happen to just about everyone. For me, the airline delays are just a way of life at this point. There’s no avoiding it. Whether you’re going through Dallas-Ft. Worth, Atlanta, or Chicago’s O’Hare, you’re going to end up waiting at some juncture. Expect the unexpected. While I was on a plane headed to Atlanta via Chicago last weekend, the inevitable happened. Bad weather = limited flight capability. We found this out as we were leaving the gate (45 minutes late) and were taxiing down the tarmac. Everything came to a halt, there was a loud “DING!” and the captain announced that we were at a standstill for the next 45 minutes due to bad weather in Atlanta. We were 15th in line once the weather lightened up for us, only to have to return to the gate for more fuel. Now, I’m a patient guy. I had plenty of reading material, knew better than to book an appointment the day I was traveling in, and happen to be fascinated by weather (I knew we’d be delayed because I was watching NOAA’s Storm Prediction Center’s weather reports.) Sadly, this was not the case for several passengers on my flight. I chuckled to myself and thought that this would make an excellent blog post. You see, inspiration comes in all forms. You just have to capture it before it escapes you. Patience really IS a virtue. Patience and a good sense of humor can really help manage the challenging situation. 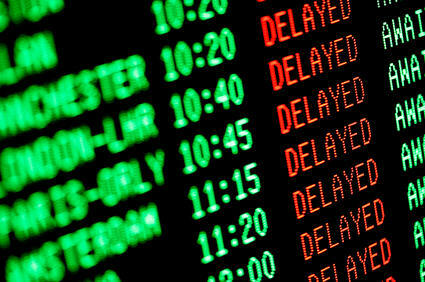 Regardless if it’s an airline delay, staff issue, or unexpected work dilemma, patience is key. Step back ten feet and laugh. Can you change the situation? If not, make the most of it. If you can change it, do so with care. You’re not helping anyone by being the complainer – it just makes things worse. Here’s a great example: One gentleman (we’ll call him Bob) felt compelled to let EVERYONE on the plan know that he was missing an important golf event. Bob huffed and puffed, calling the pilot, flight attendants, and just about anyone else associated with the airline disrespectful names. This wasn’t a grumble to himself. These feelings were expressed publicly and loudly so all could hear. We didn’t need that. And, to tell you the truth, his complaining did only two things: It upset a lot of other passengers and it made him look like a fool. Expect (and prepare for) the unexpected. Be prepared. For everything (or as much as possible.) Can you travel in the day before your meeting? There are many advantages to this including the fact that if you’re delayed, you won’t miss your appointment. Plus, you can get a nice night’s rest before going in to land that big business deal, interview, or partnership the next day. Pay attention to the weather. Know when to expect delays. Flying to Tornado Alley in the Spring or Summer? How about Buffalo, NY in December or January? Do a little pre-travel research before going. Believe me, you only have to go to Minneapolis in January (-25F without counting wind chill) without packing gloves, a scarf and heavy coat once. BRRR!! You can learn from the challenges, or you can make it worse. Like I said before, you can learn from your mistakes in life. Everybody makes them. We’re human. Let’s learn from the mistakes and adjust accordingly. If you can’t learn from the flubs in life, you’re going to have a long, hard road ahead for yourself. Don’t be like Bob. Learn from your mistakes, expect the unexpected, plan ahead and remember: we’re human. Patience goes a long way. A smile adds to it. Be nice. Be friendly. Remember to laugh. So, road warriors – what have you learned from your worldly travels? Any tips you’d like to share? Please feel free to leave a comment! As always, thanks for reading. I truly appreciate it. Previous Why Do We Hide Behind Technology? Pingback: Life Lessons from Airline Delays « Campus To Career | What Are You Looking For? I was a flight attendant for six years so I can tell you that the crew appreciates passengers like you! When the crew says, “Thank you for your patience” that is code for “Don’t give me any lip because now I’m going to miss my flight home to my family and will have to stay the night in the airport” or “I haven’t eaten in nine hours because of these damn delays so don’t mess me with me”…..
Word of advice: Always book the first flight out if at all possible! That is the best way to avoid those pesky weather related delays that WILL happen no matter what season. Plus people aren’t all riled up at that time in the morning- they’re more like zombies! Flight Attendants LOVE zombies! And the zomb….I mean, er…. passengers LOVE happy (on-time) flights! Happy Flying & Safe Travels! Thanks for the comment. That explains a little more about you! 🙂 Flight attendants are people too. Patience goes a long way. My mother always said “just because you’re having a bad day doesn’t mean you can ruin it for everyone else.” Smart lady. I was actually in the last airplane permitted to depart Atlanta that day heading to Chicago when I was 13. Trust me, you didn’t want to be flying through that crap. Honestly, he’s right. I’m thankful to have made it as well as I did, The wind was terrible and we almost fell out of the sky a few times.